What is an Alabama Eviction Notice? Alabama Eviction Notice: What Is It? An Alabama eviction notice, also known as a Notice to Quit, is a document used by landlords or property owners to inform tenants who break the terms of the existing lease that they must vacate the property within a certain amount of time unless they correct the defect. The most common reason an eviction notice is used in Alabama is failure to pay rent. However, it can also be used to terminate a month-to-month lease agreement. What Are the Components of an Alabama Eviction Notice? The components required to create an Alabama eviction notice depend on the reason behind issuing it. In this section, you’re going to learn about the components required for non-payment of rent, components required for lease violations, and components required to terminate a month-to-month lease agreement. While we’ll discuss legal considerations in the next main section, it’s important for you to remember that all eviction notices must comply with Alabama’s landlord-tenant laws. You’ll learn more about those in the next main section, too. The legal name of the tenant(s) who are responsible for fulfilling the terms of the lease (including payment of rent). The address of the property as written in the lease agreement. The name of the landlord and / or property management company. The amount of rent past due. The date the eviction notice was drafted. The printed name and signature of the landlord / property manager. How the notice will be served. They criminally assault a tenant or guest at the rental property, with the exception of self-defense, defense of a third-party, or as permissible under §13A-3-23. The name of the tenant(s) responsible for upholding the terms of the lease. The address of the property as listed in the lease agreement. An explanation of how the lease was violated. Whether the lease violation is curable or incurable. The date that the original lease agreement was signed and when the first rent payment was made. The legal name of the tenant(s) according to the lease. The address of the rental property as listed on the lease. The effective date for the eviction notice (remember, you must give 30 days’ notice). The signature of the landlord and / or property management company issuing the notice. The signature of the tenant to show that they received the notice. A description of how the notice was served. What Are the Legal Considerations of an Alabama Eviction Notice? All Alabama eviction notices must comply with landlord-tenant laws in the state. Let’s discuss some of the laws. There is no rent grace period. This means that landlords do not have to wait a certain amount of time after non-payment of rent to create an eviction notice. If you’re evicting the tenant for non-payment of rent, they have seven days to vacate the property or pay their rent. If you’re evicting the tenant for a lease violation, they have seven days to vacate the property or correct the violation. If you’re using an Alabama eviction notice to terminate a month-to-month lease, you must provide 30 days to vacate the premises. An eviction notice is just the first step. You may also need to file an eviction lawsuit, known as unlawful detainer, to recover what’s owed to you in rent, monetary compensation for damages to the property, or to even force the tenant to leave. You can learn about the legal requirements for this process by reading the Alabama state law. After you draft your eviction notice, you must serve it. This can be done in several ways. Certified mail can be used. You will be notified when the letter is signed for. You could opt to use a private process server or the sheriff. With this method, you would be provided with proof of service. This can be important if you file a lawsuit against the tenant. You could serve the tenant yourself. While that is certainly cost effective, it can also be dangerous. Most no-fault or termination without cause evictions. Raising the rent to an excessive amount. Alabama requires landlords to provide notice if they plan to raise the rent. This is not a complete list. To learn more about unlawful evictions, talk with a landlord-tenant law in the county where your rental property is located. Most eviction notices for lease violations, including non-payment of rent, must give you seven days to correct the issue. However, there are certain lease violations that are considered incurable. Eviction notices in those circumstances do not have to give you a certain amount of time to leave the property. Additionally, if you’ve received a notice to quit for lease violations four times within a 12-month period, the landlord or property manager does not have to give you seven days to correct the issue. The five most common reasons that Alabama tenants are evicted include unpaid rent, a violation of the lease, a month-to-month lease is being ended, your 12-month lease expires, or you have a roommate that you’re trying to get rid of. If you receive an eviction notice, read it carefully. If you have seven days to pay your rent or correct a lease violation, take care of it. Contact your landlord if you have questions. Be calm when you speak with them. If you believe that the eviction is illegal, talk with a landlord-tenant lawyer to determine whether you have a potential lawsuit against the landlord. If you can’t afford a lawyer, contact legal aid for help. Eviction for any reason other than the end of a lease agreement can make it hard for you to secure adequate housing in the future. If you’re sued, that could go on your credit report. Eviction notices are required by Alabama law. Make sure that your eviction notice follows Alabama landlord-tenant laws. If it doesn’t, the tenant may not be required to vacate the property and they may even have the ability to file a lawsuit against you. Make sure that you serve the tenant through one of the following: certified mail, using a private process server or the sheriff, or in person. Remember that emotions often run high in these situations. Serving the tenant yourself could be dangerous. If you do not properly serve the tenant, you cannot start the process of an unlawful detainer lawsuit if it becomes necessary. You could also set yourself up to be named as a defendant in an unlawful eviction lawsuit. A copy of the completed rental application for each tenant. Copies of late rent notices or other notices you gave the tenant for violating the lease. Remember that these notices must give the tenant a certain amount of time to correct the issue in most cases. 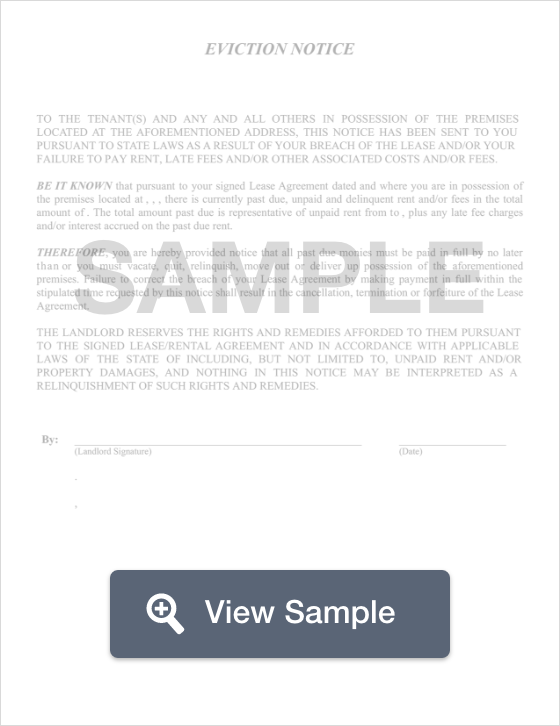 A copy of the signed lease agreement. Copies of other documentation such as a notice to raise the rent. Proper documentation is key to a successful and legal eviction. If you have questions about evictions, talk with an Alabama landlord-tenant lawyer in the county where your rental property is located.